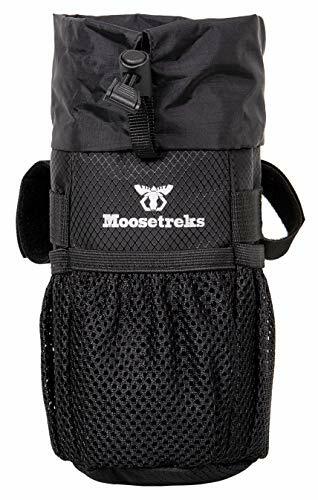 Moosetreks Bike Stem Bag - Designed to provide easy access to food/snack, water bottles, phone/camera, keys, small tools, etc. while riding across town or across country! Convenient Storage Solution - Moosetreks Stem Bag is large enough to hold a 32oz Nalgene water bottle or other large bike water bottles. Load this bag up with snacks, food, small jackets, or other small tools. Three convenient mesh side pockets provide extra storage for small items such as energy bars, phones, trash, etc. Easy 3-point Attachment - Simply use the secure velcro loops to attach the bag to your handlebars and stem, then clip the strap at the bottom of the bag through your fork and then tighten the strap. The 3-point attachment system is secure enough for rough trail riding! For even more storage you can attach 2 stem bags, one on both sides of your stem! Insulated - Moosetreks Stem Bag is insulated to keep your drinks cool! There is also a drainage hole built into the bottom of the bag to allow easy cleaning and draining. One Hand Access - The top of the Moosetreks Stem Bag closes up with a drawcord cinch down system designed to prevent your gear from bouncing out while traveling over rough terrain. Quickly close your Moosetreks Stem Bag with one hand by pulling up on the drawcord. To open your Moosetreks Stem Bag, simply pull down on the cinch lock. Constructed from Durable Water Resistant Material - Built to last! Made from durable and water resistant ripstop nylon, this stem bag easy to clean and designed to go the distance! EASY ONE-HANDED ACCESS - Attaches to your bike handlebar and stem allowing for quick and easy access to snacks, water bottle (large enough for 32oz Nalgene bottles and standard/large bike bottles), base layers, phone/camera, etc! The top closure opens and closes quickly with one hand. CONVENIENT STORAGE SOLUTION - Large enough to fit 32oz Nalgene water bottles and standard/large bike bottles! Mesh side pockets are perfect for holding energy bars, trash, phone, small tools, etc. SECURE 3-POINT ATTACHMENT - One velcro loop attaches stem bag to your handlebars, a 2nd velcro loop attaches to the stem, finally clip the strap at the bottom of the bag through the bike fork and tighten the strap. Securely holds your gear even through rough trail trail riding! Removeable and adjustable velcro loops allow you to attach the bag to either side of your stem. Maximize your storage capacity by installing ONE ON EACH side of your stem! INSULATED AND DURABLE - Moosetreks Stem Bag is insulated to keep your drinks cool! There is also a drainage hole at the bottom. Made from durable ripstop nylon this bag it designed to go the distance! VERSATILE - Adjustable velcro loops allow you to attach the bag to either side of your stem. Maximize your storage capacity by installing ONE ON EACH side of your stem! If you have any questions about this product by Moosetreks, contact us by completing and submitting the form below. If you are looking for a specif part number, please include it with your message.